Description: In this study, Andrew Tobolowsky offers a new approach to biblical descriptions of the tribes of Israel as the �sons of Jacob�. He reveals how shifting assumptions about early Israelite history and the absence of references to Jacob in most accounts of the tribes make it unlikely that this understanding was part of early tribal discourse. Instead, drawing on extensive similarities between the role Jacob's children plays in the biblical narrative and the role that shared descent from figures such as Hellen and Herakles play in the construction of ancient Greek histories, Andrew Tobolowsky concludes that the �tribal-genealogical� concept was first developed in the late Persian period as a tool for the production of a newly integrated, newly coherent account of a shared ethnic past: the first continuous biblical vision of Israelite history from Adam to the fall of Jerusalem and beyond. 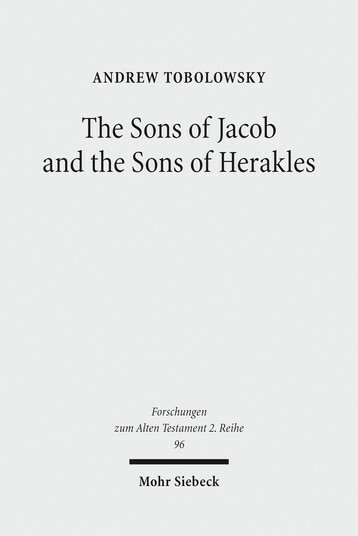 Citation: Nathan LaMontagne, review of Andrew Tobolowsky, The Sons of Jacob and the Sons of Herakles: The History of the Tribal System and the Organization of Biblical Identity, Review of Biblical Literature [http://www.bookreviews.org] (2019).